As Valentine’s Day approaches, I’ve noticed an increase in bitter and sad status updates. Valentine’s Day can really bring out the bad in people. Although I’m probably preaching to the choir about this, there really is no need to be so down and out on Valentine’s Day. I’ve gone several years without having a Valentine. While I will admit that when I was younger, it did make me sad that I was missing out. However, as an adult without a Valentine, I didn’t allow the Hallmark holiday to get me down. I have been blessed to have a Valentine for the past 3 years, but before then I would think of things to do to keep my spirits high. With that said, I’ve come up with a list of 5 things you can do to prevent the Valentine’s Day Blues. 1. Send a gift or flowers to a friend who doesn’t have a Valentine. Giving is always better than receiving, and if you have a good heart, this will be an easy way to keep you happy on V-Day. 2. 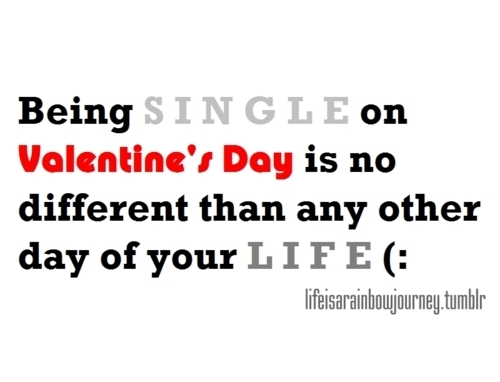 Go out with some friends, who don’t have Valentines either, for dinner/drinks. When you’re having a fun, who has time to think about other things that don’t really matter? 3. Steer clear of social media sites if they’re going to make you sad. People will be posting status updates and uploading pictures. So, if you can’t handle it, stay away. I remember one year I read a status update where this girl posed the question, “I wonder what it feels like not having a Valentine?” I’m sure that struck a chord with a lot of her “Facebook friends”. You should know that I don’t believe she’s had a Valentine since then. However, not everyone posting on Valentine’s Day is trying to hurt those who don’t have a Valentine, but again, if someone’s happiness is going to bring you down, don’t login. If it doesn’t bother you, proceed as normal. 4. Do something nice for yourself. I’ve heard of women sending flowers to themselves. You can do that or buy yourself a nice gift. I love getting a pedicure, so that could be something you treat yourself to. 5. Make a mental note that Valentine’s Day is only one day in the year. While you may not have a significant other to shower you with love, and gifts on this particular day, you have other people around you that love you everyday of the year. Gifts and flowers don’t equal love, emotions and actions do. Posted on Tue.Feb.12.2013, in Life Lessons and tagged alone, aviation, be happy, bitter, depressed, depressed on Valentine's Day, depressing, flower, flowers, gift, gifts, Hallmark Holiday, happy, holidays, home, lifestyle, love, men and women, nature, pedicure, pink, relationships, roses, S.A.D, sad, send a gift, send flowers, single, single awareness day, single so what, sweet, the blues, Things for Singles to Do on Valentine's Day, treat yourself, V-Day, Valentine, Valentine's, Valentine's Day, Valentine's Day Blues, white, winter. Bookmark the permalink. 13 Comments. Lol! Chile…I know about that #3. But anyhoo..its just another day to me. Although Vday is nice and all, I rather have my man showing his love to me year round. Love the posts btw. Keep ’em coming!